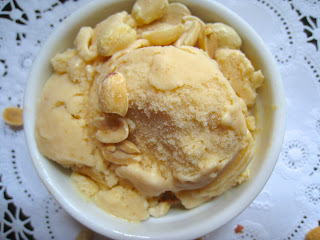 Mutritious Nuffins: Peanut Butter Frozen Yogurt. Happy August everyone! As I type this post, it's July, and I anticipate some hot weather ahead for New Englanders in August. But as you read this post, it's August, and I am busy busy studying Organic Chemistry. I am completing my last pre-requisite before starting the ND program (naturopathic medicine program) in the fall at Bastyr University in Seattle, Washington. This East Coast girl, turned California girl, is now a Seattlite(?) I never imagined this! Now can say I've lived in all four corners of the USA. I was born and raised in Florida, lived in New Hampshire until college, lived in Southern California for my undergrad, and now I am pursuing my doctoral degree in Washington state! How cool. Even though I haven't moved around "a lot" in comparison to some people, I still feel as if I have. Am I an East Coaster now? Or a West Coaster? For the past four plus years the West Coast has been my home, and now for the next four plus years (at least) the West Coast will continue to be my home, only instead of the Southwest I'll be in the Pacific Northwest. Once I was just starting to feel like a true CA girl, I'm off to Seattle. Sunshine to rain. Dirty LA traffic, to clear Seattle roads. It's a new adventure. But enough about traveling. Let's take a look at this yogurt. YUMMY. This recipe was inspired by a guest post over at Kimi Harris' blog The Nourishing Gourmet. I didn't have exactly the right ingredients the original recipe called for, so I made some changes, and now instead of honey and tahini ice cream, it's more like peanut butter frozen yogurt. The 1/2 cup of raw honey was a little sweet for my taste, so next time I will probably reduce to either 1/3 or 1/4 cup. If you aren't partial to peanut butter, feel free to use tahini, cashini, cashew butter, almond butter, coconut butter, sunflower seed butter, etc. But if you're a peanut butter fan (in moderation of course) like me, you'll love this recipe! Chocolate chips would go great with this too! 2. Pour into ice cream maker and churn per manufacturers instructions. 3. When ready, scoop into reused plastic yogurt containers (or another vessel) and freeze for at least 12 hours. Serve when frozen yogurt has hardened. You may also want to remove from freezer a few minutes before serving. Enjoy! Make this frozen yogurt as a healthy "cool-off" treat to beat the August heat. East Coast humidity is something that I definitely don't miss on the West Coast! You can also put this fro-yo into popsicle molds for yourself or the little kiddos in your life. I can't wait to do this when my little nephews get older! Question for you: how much does your location relate to your identity? Wow. Well, being able to live independently in another country would give you a lot of lessons, experiences, and tests on how well you will be able to handle things by yourself. Kudos! Anyway, this frozen yogurt recipe is one good healthy treat indeed. It would not just serve as a refreshment, but it would also give your body a lot of benefits from the vitamins that it has. These include vitamin B12, potassium, iodine, and zinc.